Over the past few weeks we have seen a marked improvement in our winter Chinook catches. As per usual, we are seeing quite a few undersized salmon for this time of year. The big surprise has been the size of our keeper fish. We are seeing fish in the 12 to 16 pound range in our local waters. These fish are the best eating salmon of the year and, boy do they fight! Runs of a 100 to 200 ft. are common with these active fish. The Vancouver harbor, Howe Sound and Bowen Island have been the places to go. Inside the harbor the freighters have been our main choice and Tunstall Bay on the west side of Bowen Island has been the other hot spots. We have been running flashers with all our gear; 2¾ to 4 inch spoons have been the ticket. Choice of spoons has been the green-glow, midnight rider and cookies & cream. The army-truck coloured spoons are the ones that have produced our biggest salmon. Depths have been, 90 to 150 ft. in the Bay and 100 to 180 in Howe Sound. Look for the bait this time of year, as this is very important to be able to target the fish. Fish near the bottom, as this is where the salmon are feeding on the bait. The commercial crab season closed on December 1st and because of this, our crabbing has picked up a lot. Traps are set on all of our charters. Prawning has also been excellent. This activity takes a 7 or 8-hour charter. The weather looks promising over the Christmas holidays so we’ll be fishing everyday at this time of year. If you want to get out on the water please give us call. Enjoy your holiday season and have a happy new year. 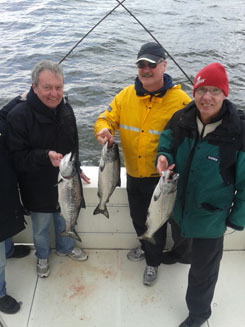 In the past 3 weeks our guides have been fishing winter Chinook salmon with mixed success. We have been blessed with fairly good weather recently so it has been clam and sunny which makes it much more pleasant to be on the water at this time of year. Our company specializes in the winter fishery and has been out on the water a lot lately. The amount of bait balls in English Bay since late October have been very impressive, this bodes well for salmon fishing this winter. In the last few days our charter boats have seen their catch improve quite a bit. Most of the salmon we have been catching in the early winter season are under-sized, less than 24.5 inches, so we only catch and release this size of fish. We have seen some salmon in the 8lbs to 15lbs range. A few of these fish have been caught in English Bay but the majority of the bigger ones have been caught on the west-side of Bowen Island; Tunstall Bay to Hut Island. English Bay is where we tend to concentrate at this time of the year. This fishery tends to produce higher numbers of salmon; even though these young Chinook salmon are smaller, they are full of fight. The gear that we’re running is mostly spoons in the 3 to 3.5 inch range. Glow/green, midnight rider, small sliver Tom Mack’s and kitchen sink are some of our favourites. Glow flashers and green/silver flashers are always run in conjunction with our spoons. Bait with flashers is also an option at this time of year. Prawning has been excellent with 100 to 200 prawns per set being the norm. Crabbing has been so-so but this will improve shortly as the commercial season closes at the end of November. A larger chunk of the sockeye salmon run has moved up the Frasier River in the last month and the fall run of the big Chinook are definitely here. We have been fishing the Capilano River mouth with very good results. 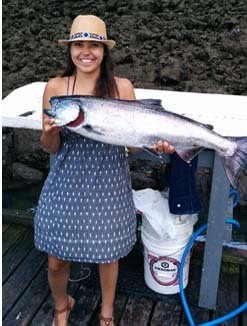 A lot of our charters have seen double-digit hook ups of Chinook salmon between 10lbs and 35lbs. Whole herring and anchovy with flashers have been working well for us. We’re fishing mainly on the bottom, from 60ft to 120ft in depth. Both ebb and flood tides have produced good fishing. The slack tide between the two tides is the key! The sockeye fishing has been excellent. We have millions of salmon staging in front the Frasier River and this trend seems to be growing by the day. Sunny weather has caused the salmon to hold at the Frasier River mouth waiting for rain. The weather looks like it is going to be sunny for another few weeks at least, so the sockeye fishing should remain very good. One of the big tricks to this fishery is to find the biting schools of sockeye and stay on them. Fish 70ft to 120ft deep with pink hootchies with lots of dummy flashers. We are starting to move a little further south as we move through September so T-10 and the Sand-heads will become the hotspots to fish. Sockeye fishing has been stellar with most of our charters getting into double-digit figures. We are fishing mainly the Bell Buoy to the north arm jetty. As we move further into the run, spots such as QA marker, T-10 and Sand-heads will become more important. We are fishing mainly 60ft to 100ft in depth. As usual, pink glow-head hootchies on short leaders are the ticket. We are using red and sliver flashers. Flasher colours also include, jellyfish with glow strip and kinetic coloured flashers. Stacking 2 or 3 levels of dummy flashers is a must, especially when the bite is tough. If you want to catch fish, its time to go! Well, the sockeye fishery is open and the forecast from DFO is that this run is supposed to be epic. Every four years, we get the big run of sockeye and this year is the big run! 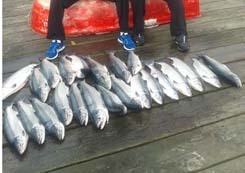 Our fleet has been fishing mostly the West Vancouver area with fairly good success. 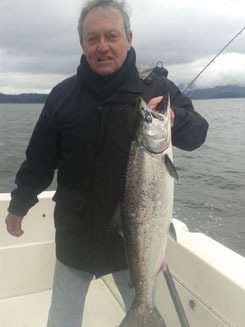 We have caught Coho in the 4 to 10 pound range and lately quite a few bigger Chinook, ranging up to 25lbs. White hootchies, small pink Apex and anchovy, all run with flashers have been our preference. Our guides will start to move from our summer fishing grounds into the front of the Frasier River. This will enable us to fish mainly sockeye which is now open. Big Chinook and Coho will be mixed in with the sockeye schools. Stay tuned for updates. We have been experiencing some really spectacular weather lately, with calm water and long warm, sunny days. It is some of the best fishing weather we have had all year long. 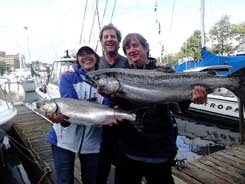 Some of our charters are still fishing the Gulf Islands with excellent results. Our guides have been some of the top producers in this fishery with Chinook salmon now weighing into the high 20lbs to 30lbs range. Our charters have now moved into the reefs closer into the Gulf Islands. We are fishing a little deeper; 100’ to 180’ in depth. Anchovy and glow hootchies have produced the best. Lingcod and rock cod fishing continues to be very good. The fishery off the West Vancouver shoreline has turned on. Coho have shown up and with a few weighing into the 8lbs to 10lbs range. This is very good for the early Coho run. We are targeting the areas from Point Atkinson to the flats in front of the pink building. We’d suggest you troll a little faster, using anchovy, glow hootchies or small spoons. Chinook salmon are also being caught in this area mostly using anchovy. All of our lures and bait are being run with flashers. The weather has turned much sunnier and warm lately and we have been catching decent numbers of Chinook salmon in our fishing spots. The guides are concentrating in three main areas. Close Vancouver, we are fishing the entrance to English Bay in 160’ to 200’ of water. A little further out we have going out to half way between Point Atkinson and the last mile-marker. The Bell Buoy and QA marker have also been consistent. The Hump and the Slash areas have also been fairly consistent. Water depths in this spot are between 500 and 700 feet. We’ve been setting our gear between 80’ and 140’ - with the 120’ to 130’ range been the best producing depth. In the Gulf Islands, Thrasher Rock and the Flat Tops have been very good. We’ve had days where our guests have hooked up over a dozen times. There the guides are fishing mostly offshore in 800’ to 1200’ of water. Fishing depths have been between 80’ to 160’. Try a few depths to determine which is working best on that day and then stay at that range. Tackle of choice always includes glow flashers and terminal tackle. Flashers with double glow sides have been working best. Try spoons such as glow green, cop car or paddy wagon colours and strawberry cream have been our best producers. Glow-green or white hootchies have been producing well and anchovies in glow head-holders are also worth a try. This time of the season crabbing at its best, and we’re limiting out almost every trip. Our spring run of Chinook salmon is starting to arrive in good numbers. We have moved out of English Bay; where we’ve been for most of the winter. We’re now starting to concentrate on the south side of Bowen Island. The Hump and Slash areas are our prime locations. 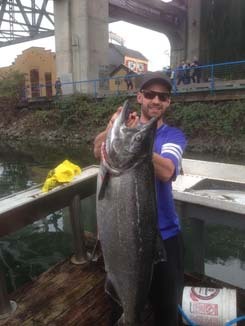 We’ve had some very nice multiple fish days, with the average size of the Chinook salmon between 8lbs and 20lbs. We have started to use our glow gear exclusively as the water is just starting to cloud from the spring river run-off. While the anchovy bait has been working, our staff is using primarily 3½” Silver Horde spoon or glow hootchies. All the gear that we are running is in conjunction with glow flashers. Our trolling depths have been from 60’ to 150’ depending on the day that you fish. These depths can change from day to day, so determine the depth that is working best for you and stick at it. The most productive depths for our fleet have been between 120’ to 140’. Crabbing has also been very good. We set traps with every charter. For out-of-town guests we can package your catch to travel and store it until you’re ready to leave. We can also steam some fresh crab from your charter on the dock. Whatever you do, have fun out there.